The Boer War memorial, Forest Recreation Ground. Memorial to the fallen on the Forest Recreational Ground, Waverley Street, Nottingham. Lists of names on all four sides of pedestal, to the memory of officers and men of the Royal Sherwood Foresters, the Imperial Yeomanry and the Robin Hood Rifles. Also, regimental badges of Sherwood Foresters and Imperial Yeomanry. It was unveiled 26 March 1903 at the Prudential Building, Queen Street. 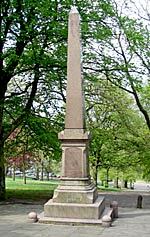 The monument was moved in 1927 to its present position. It was commissioned by Sir Thomas Birkin, the Nottingham Lace manufacturer. Brass plaque in St Mary’s Church, Nottingham. Memorial window, St Swithun's church, East Retford. 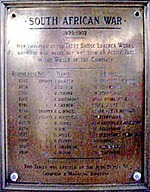 The Eastwood South African (Boer) War memorial tablet, to those who fought in South Africa 1899-1902, was unveiled at Eastwood Church in 1904, but it is believed that it was lost in the fire of 1963 that destroyed most of the church. No pictures exist but from the Eastwood & Kimberley Advertiser there is a note to say that it was erected by the Eastwood and District Associated Trades Guild and situated on the south wall of the church. The Turney Brothers memorial plaque (thanks to the staff of the Wollaton Hall Industrial Museum for allowing access and Paul Ellis for locating the plaque). The Turney Brothers Ltd memorial plaque used to be on display at the Trent Bridge Works in Nottingham until the factory site was redeveloped. It is now on display at the Wollaton Hall Industrial Museum. The Beeston South African (Boer) War memorial can be found beside the pavement in Broadgate recreation Ground, Broadgate, Beeston. It was moved here in 1912 from Beeston Square, Beeston when the Square was redeveloped. It takes the form of a pedestal upon which is mounted a female figure, representing Hope with her right hand resting on a single column. The inscription is inscribed into the face of the pedestal. The memorial was unveiled on 13th february 1904 by Colonel Sir Lancelot Rolleston; the architect was Mr Arthur Maskell and the masons Messrs. Pask and Thorpe. Details appeared in the Nottingham Evening News, 13th February 1904. Lord Street, Roberts Street, Kimberley Street, Ladysmith Street, Mafeking Street, Baden-Powell Road, Kingsley Road, streets off Colwick Road, Sneinton, named after various battles and personalities. Streets named after the Boer War in Sneinton (Ordnance Survey 6" to 1 mile map, 1914).